Our family runned this seventeenth-century mill for generations. And now we intend the memory not to be lost for the enjoyment of our guests. The same vigilance and care we have put into the recovery of the industrial heritage of this mill, we have also dedicated in all its restoration taking the máximum care of every tiny detail. We maintain a small library specialized in topics related to the mills that will delight ethnography lovers. I grew up here, among the sound of water, the smell of bread and in the middle of an environment where it seems that time has stopped, emphasizing the importance of simple things and the traditions. When Little with my family I enjoyed the place and the wonderful natural surroundings along the river, the poplars, the birds. Actually it was great to live here!. To see how my parents made the flour and then bread, is unforgettable. I remember swimming in the crystal clear water of the river, fishing, hiking and playing games. Now I'm older I enjoy having restored it and seeing that the place retains all the charm of langsyne. To watch my daughters today enjoying it as much or more than I did as a child, has for me and my wife a great value. Our mill has turned into a high quality accommodation, which integrates comfort, modernity and tradition. Who chooses it as a holiday spot will find in it an authentic, unique, distinct accommodation. With history and with lots of character. The traditional flavor of its construction based on stone, wood and mud recreates a cozy and warm atmosphere hidden behind its thick walls of large windows. The tranquility, the freshness, the sound of water as in the mill is a waterfall that collects water from the pond and the spring which is within the property. We make guests enjoy the place, to make their holidays unforgettable. This is the result of a very special blend that combines XXI century commodities with the history, tradition and charm of a quaint building. It is in the heart of Andalusia, halfway between Cordoba, Malaga and Granada. An ideal place to visit with family and friends who like to enjoy quiet places with an andalusian flavor, surrounded by olive groves and picturesque villages. Traditional water mill surrounded by nature on a full house regime,private pool, WIFI, BBC.One of the most interesting routes in Algarinejo township, in west Granada is this 2 kilometers route close to the Mill that runs along the margin of the Morales creek in a spectacular landscape filled with nature and local attractions: ponds and hot springs suitable for swimming, waterfalls, well preserved fauna and flora, archaeological and ethnological remains. Will you dare to discover it? Bathroom with original ceramic tiles grenadine. The house has a fireplace in the living room of the first floor,; in the second floor there is underfloor heating and electric heating. In two bedrooms. Included in the price: bed sheet, duvet and quilt. Included in all rooms three for each guest, one to pool, and two to bath in the home. There is one dishwasher only and it is in the kitchen more big next to swimming pool. There is a fridge in the outdoor kitchen and it is very large. And there is one fridge in each kitchen. There are two oven, one in each kitchen. There is one microwave in the small kitchen. In our kitchens there is coffee pot of italian type. Completed cutlery with many and different utensils. The house has three kitchens of different sizes. One is on the outside, next to the pool. In the different kitchens there is a table to eat and they have differents sizes. However, tHere is an outdoor dining table up to 10 people in the area of swimming pool and BBQ. We had a wonderful holiday here with 9 extra young people coming and going for the whole two weeks. It worked perfectly for this as there was so much space. The pool and kitchen next to the pool was excellent. We cooked every night and all sat round the table having a lot of fun. The villa has been well restored and it was a very interesting place to stay and spotlessly clean. The pool was large and lovely and we often spent a whole day at the villa which was very peaceful and relaxing. The nearby village of Algarineco has all that you need, and we were able to do early morning walks and runs along the very quiet roads that go through the olive groves. The only downside was that it does take a long time to get to places. The nearest motorway is about three quarters of an hour away, but we were able to get to Granada and Cordoba for day trips. Priego de Cordoba and Montefrío are both also well worth visiting, and Priego has a very good supermarket. However, the driving was a small price to pay as you are well and truely off the tourist routes and we were able to appreciate rural Spain with no crowds. Pino and Pedro do an excellent job cleaning and maintaining the villa and are very pleasant. 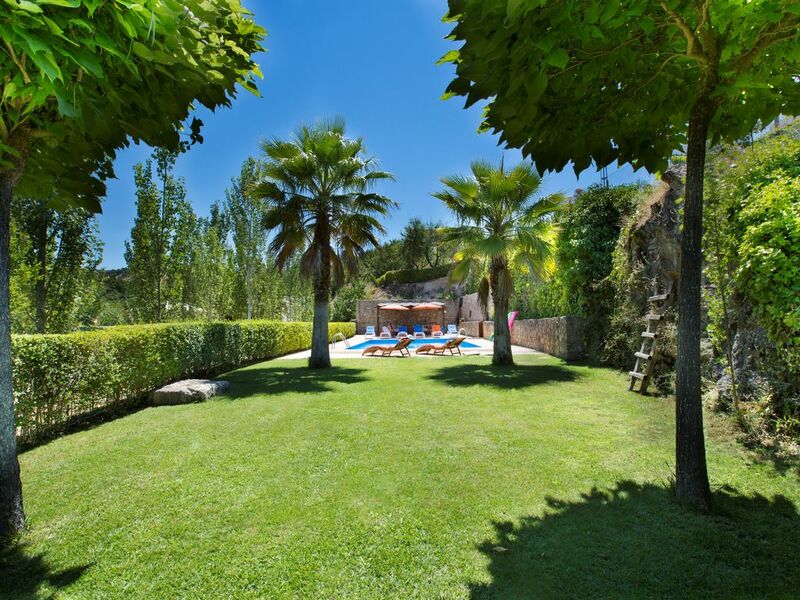 So, I would highly recommend this villa, particularly to those who are in a large family or friendship group and who want a peaceful holiday in unspoiled rural Spain. Great fun, great villa, great location. Thanks Adrian, Sarah and family. It was a pleasure offer you our home. Thanks you for your words about us and the property, this helps to the rest of persons to look for a special place for their holiday. We are very happy that you enjoyed your vacation and we hope you come back someday. Vi hade en varm vecka omgivna av olivlundar och uppskattade det vackert renoverade huset + poolen! De sista 30-40 minuterna till Algarinejo är på snirklande smala vägar och allt du ser är kullar täckta av olivlundar. Trots att det knappt syns andra turister i den lilla byn (3 km från bostaden) finns där 3 restauranger och en fin matbutik med delikatessdisk och folk är mycket vänliga och hjälpsamma, även om det ibland var svårt när vi inte talar spanska! Vi tyckte att vårt vattenkvarns-residens var häftigt; en annorlunda byggnad, varsamt renoverad och stilfullt inredd. Här har värdparet verkligen lagt ner sin själ! Det var faktiskt skönt att vi knappt hade någon telefontäckning. Vi spenderade mest tid vid poolen (barnen var i mest hela tiden!) och åt alla måltider på uteplatsen bredvid det största köket, som bekvämt nog var utrustat med massa kryddor mm. Vi vandrade längs med ån en dag ända till byn och badade under vägen i en av de naturpooler som fanns invid ett vattenfall, dem var ca 2 m djup och vattnet var skönt svalkande! En dag åkte vi till Granada (cirka 1 h och 20 min i bil) och såg Alhambra. En vacker stad som vi hade velat stanna fler timmar i. Värdparet var enkla att kommunicera med och vi kan rekommendera fler att uppleva den gamla vattenmöllan! Teresia y su familia han sido unos huéspedes increíbles: amables, respetuosos con la casa... saben apreciar el entorno, disfrutar de las costumbres del lugar y valorar el cariño con el que hemos restaurado y cuidado la proiedad y a nuestros huéspedes. Son unas personas muy cuidadosas, nos encontramos la casa limpia por completo, lo que agradecemos de corazón. Son unos huespedes 100% recomendables. Muchas gracias por elegirnos y serán bien recibidos siempre en muestra casa. Un abrazo. Nous avons passé un séjour fantastique dans la propriété de Pino et Pedro. La maison est un paradis, magnifique, très bien équipée et ... qui reste fraiche même pendant les chaudes journées d'été. Les espaces extérieurs (cuisine, piscine) sont formidables ! Nous avons vécu dehors tout le temps. Pour visiter Grenade, Malaga, Cordoue ou encore Antequerra, le moulin est très bien situé. Il faut compter 1h15 à 1h40 de route mais c'est tout à fait accessible. L'accueil et la gentillesse de Pino, Pedro et de leur famille participe beaucoup à la réussite du séjour. Bref, un des plus merveilleux séjour que nous avons pu passé en famille ! Merci à vous Pino et Pedro ! Gracias a vosotros por ser unas personas tan educadas, respetuosas y agradecidas con nosotros. Cumplen a la perfección con aquello que todo propietario espera de las personas a las que abren las puertas de sus casas: amabilidad, y responsabilidad. Además de el carácter amigable de Guillaume y su familia, destacamos lo ordenada, limpia y perfecta que entregaron la casa. Agradecemos de corazón la valoración de la atención recibida y nuestro trato, al igual que del trabajo y dedicación que ponemos en cada detalle de nuestra casa. Esperamos verles en otra ocasión. Serán siempre bien recibidos. Excellent séjour en famille dans cet ancien moulin très bien aménagé. Les propriétaires, très sympathiques, que nous avons vu le dernier jour, ont conservé les équipements du moulin (cuve, four) et décoré chaque pièce avec beaucoup de gout (tomettes, vasques en céramique, …). Tout ce qu’il faut pour accueillir une grande famille: 2 salles de bains, 3 cuisines, vaisselle abondante, literie impeccable, linge de toilette, draps de bain pour la piscine. Grande piscine très bien installée avec auvent et chaises longues, avec une longue exposition au soleil ... On peut déjeuner à proximité de la piscine (sous une tente) mais nous avons préféré la terrasse au premier étage sous la treille (à côté d'une des autres cuisines). Et de plus, la maison étant située dans les collines, la nuit la température descend à des niveaux acceptables ! Pour visiter Cordoue et Grenade dans la journée, prévoir un départ pas trop tard le matin, il faut environ 45 minutes de route qui tourne pour rejoindre les autoroutes. Muchisimas gracias por vuestras palabras. Siempre recibimos a nuestros huéspedes el primer dia y los despedimos personalmente. Mantenemos un contacto directo con ellos porque para nosotros es fundamental que se sientan como en casa. Nos alegra saber que han disfrutado en nuestra propiedad y que su estancia haya sido confortable. Han sido unos huéspedes respetuosos con la casa y sus normas y muy agradecidos y amables. Esperamos poder verles nuevamente algun otro año. Nous avons passés des vacances reposantes dans cette maison . Très agréable à vivre, le coin piscine était juste notre lieu de vie à 10 personnes.De très jolies lieux à visiter. Nous avons passe un excellent séjour dans ce merveilleux moulin décoré avec beaucoup de gout et entretenu avec soin. L’équipement de celui ci est fonctionnel. L'accueil de Pinto et Pedro est très chaleureux et nous avons eu le plaisir de rencontrer les parents de Pedro très gentils également. Algarinejo est une jolie petite ville au milieu des oliviers ou l'on trouve de bons restaurants et ou les habitants sont sympathiques. Nous espérons très vite retourner dans ce havre de tranquillité. Nathalie, Laurent y Marion son personas cercanas y muy agradables. Su sencillez y amabilidad nos hizo muy fácil entendernos con ellos. Muy respetuosos con la casa, dejaron todo muy limpio y ordenado, y lo agradecemos muchisimo. Creo que disfrutaron de su estancia y nos lo trasmitieron con su deseo de volver pronto. Muchas gracias por vuestra visita. Os esperamos nuevamente. Traditional water mill surrounded by nature on a full house regime. This is the result of a very special blend that combines XXI century commodities with the history, tradition and charm of a quaint building. It is in the heart of Andalusia, halfway between Cordoba, Malaga and Granada. An ideal place to visit with family and friends who like to enjoy quiet places with an andalusian flavor, surrounded by olive groves and picturesque villages. Great holiday mill in the heart of Andalusia, bathed in its own nascent crystalline water that flows into the Morales river stream, river that has numerous pristine waterfalls for natural baths in the countryside, with picturesque villages only a few kilometers away, such as: Algarinejo, Montefrio , Iznajar and Priego de Córdoba. An hour and a half drive from the cities of Baeza, Ubeda, Ronda, and the beautiful beaches of Malaga, Granada (Alhambra) and Cordoba (Mosque). The mill is ideal for groups of 2-10 people because of it's large rooms painted in warm and cozy colors where natural materials have been used. Its decoration is meticulous and with a great attention to detail. The traditional flavor of its construction based on stone, wood and mud recreates a cozy and warm atmosphere hidden behind the thick walls of large windows, composed of two floors and a terrace with a living area of 250 sqm. Outside, there is enough space for children's play in natural grass area and gardens to stroll or walk. There is ample parking for cars. The accommodation, which retains the original structure of the flour mill consists of two floors: the ground floor dedicated decades ago to make bread, preserves intact the original machinery integrated into a spacious living room with fireplace and a well equipped small kitchen with a very special old bread oven. On this floor you will find one of the double bedrooms with a bathroom with shower, sink, toilet and hairdryer. Upstairs you will find a master bedroom, three double bedrooms, bathroom with bath, sink, toilet, living room with satellite TV, DVD, a table for children's games and a fully equipped kitchen. The accommodation provides guests with a full kitchen in the outside area by the pool, which makes the stay even more comfortable. Next to the kitchen is a gazebo where one can enjoy a warm meal and or a romantic evening under the stars. The accommodation has all appliances and utensils needed for a stay with all the amenities. All outdoor areas are designed for rest and recreation, reading, chatting or quiet contemplation of the landscape. Its terrace offers mountain views with extensive olive groves and river whose course runs along the Mill. Guests have access to the Internet via satellite, satellite tv on a flat screen TV, DVD and games. One of the highlights is its large private swimming pool protected for recreation of children and adults (1,20- 2,10 depth) and (11x6 sqm) with sun loungers, parasols and sofas in the rest area. We also have a poolside barbecue for family meals in the large outdoor table. The pool area as well as sun loungers and parasols also includes bath towels. The kitchen is well equipped, including a kettle. There is a dishwasher, microwave, oven, mixer, toaster and full size refrigerator. Guests may have at their request a cot, a park and chair for their baby. The apartment comes with towels and white sheets. For stays longer than a week, replacement kits are available at no extra charge. English is spoken, so it will be easy to communicate with English-speaking guests who are not fluent in Castilian. Albejanar Mill is located on the border of two provinces, Cordoba and Granada. Its location gives it the privilege of being in between two natural parks and being in the heart of Andalusia, offers visitors a range of possibilities, enabling visits to many sites of various provinces. Raised at the foot of the Morales river, surrounded by extensive olive groves and lush vegetation, offers guests an ideal place for relaxation and enjoyment of the natural environment. In its immediate environment, the Albejanar mill offers you the following possibilities: hiking, mountain biking, visits to archaeological sites, a visit to the mill that includes explanations offered by the owners on the operation of the old mill, which machinery is still preserved. - Montefrío, which highlight is La Villa with the Interpretation of Western Granada museum, the Church of the Incarnation, the gipsy fellowship with its archaeological deposits. - Priego de Cordoba, birthplace of the Baroque and the seat of many churches in this style, El Adarve, La Villa, La Fuente del Rey and its various museums. - Iznajar with its impressive reservoir, less than half an hour away, where you can practice water sports. - Almedinilla, La Ruta Bética (Andalusian Road),La Villa Romana (The Roman Villa), El Ruedo (The Bullring), El poblado Ibérico. En Temporada Verano el precio es el mismo independientemente del grupo y por semanas (mínimo de 7 noches). La entrada y salida es de sábado a sábado.El resto de temporadas el día de entrada es el sábado y un mínimo de 4 noches. El alojamiento dispone de toallas, sábanas y toallas de piscina. El WIFI, es libre la contraseña se facilita el mismo día de llegada. En el precio está incluido el gasto normal de: luz, leña para chimenea y calefacción. Un gasto excesivo supondría una tasa especifica no cubierta en el precio de la casa.